So I'm guessing these changes will take place sometime next week then? Sounds like the next Content Update which would be Wed/Thursday. well I stand corrected you aren't removing the components just the salvage. Carry-On good sir! I understand that Mk 8 BioTech Implant Salvage is challenge gear but at the higher levels, you run out of it quite easily (unlike the other challenge gear being removed). I would recommend keeping the implant salvage. Overall a great update, but why oh why did you remove the most valuable piece of non g12 gear in there? MK8 Biotech Implant is one of the more rare pieces. Look at it this way. If the piece is part of the Strength Challenge, we need thousands of them and may have only a few. For any other challenge pieces, we have thousands of them and need a few hundred. I am sure you have this data. 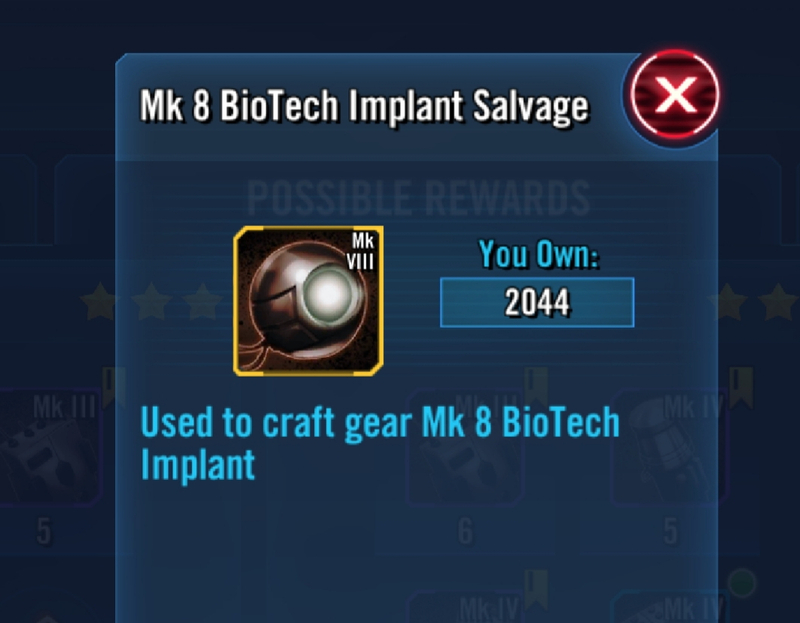 Removing this particular piece from the rewards will be considered a Nerf for upper tier players if it is not replaced with a greater chance to receive a fully crafted MK8 biotech implant. I think you guys are confusing salvage with the components. I have 850 salvage. Nope. I have less than 60 of the salvage (it gets used every time I hit 60, I’ve got so many characters waiting on it). It’s also the more expensive piece in the stores. Overall, these changes seem quite good, but I would like to object on the removal of the "Mk 8 BioTech Implant Salvage" from boxes. Some of us are really short on those and actually need more of them. Despite them being theoretically plentiful from challenges, so many characters require so many of these that yes, some of us have run out of them. This was quick and as said above helps the health of the game. There is something to be said here though. You all made this raid. And there has been constant problems with it. From nerfing toons to rewards etc. Going further what are the devs going to do about creating more content. Hopefully we do not get stuck in this position again. I’m glad you’re finally reducing the health, and it’s not just 5%. One problem I still see is that there’s no increase to rewards in lower tiers. Maybe you could up the guild currency and add a bit of guild event currency? Really the component is the part that take me awhile to farm. That and the stun guns. 100% agree, the rest of the update is amazing and kudos to you, but just consider leaving the MK8 NioTech Implant Salvage in! ^^ this is what makes me afraid of asking for things. This has been something many many players asked not to remove. I would honestly rather remove carbantis, which can be acquired for significantly cheaper in the guild store. Edit: They are right the salvage can go. I was surprised when ppl said they didn’t have many left. But then I looked at the toons that need them whew. Bad move Crumb. Isn't salvage the stuff we have 1000s of and implants the stuff we want? I just checked and confirmed it. The implant can be acquired for dirt cheap in the crystal store. It is one of the best crystal values in the game. It’s half the cost of a carbanti, despite the implant being more expensive than carbantis in every other shop. I highly recommend spending crystals on them (although maybe not now, as I would save crystals for the upcoming legendary farms). I have 1494 MK8 Biotech Implant salvage but need mega amounts of the MK8 Biotech Implant prototypes still and been playing since end of February 2017. They can't ever win eh. "Remove challenge gear!" "Wait! Not THAT one! I actually need that!" There are lower level players that need the rest of the challenge gear that's being taken out too, you know. Not just top tier players getting everyone to G12 do raids. Unless a person is a whale that has been buying MK8 Biotech Implant Components like crazy I can't see how you can run out of MK8 Biotech Implant salvage. 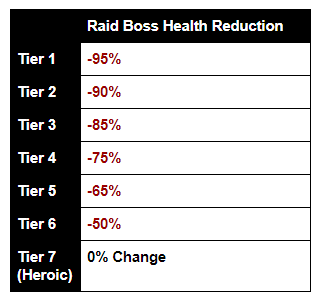 I'm actually amazed they nerfed Drain Force and Annihilate for Heroic tier too.